Pregnancy outcomes are influenced by preconception health, lifestyle and personal history. In fact, by the time many women know they are pregnant, it may be too late to prevent some birth defects, for example neural tube defects. Yes research shows that too few physicians address preconception health with their patients. The first step in building capacity among primary health care providers is to understand their current attitudes and practices regarding preconception health. 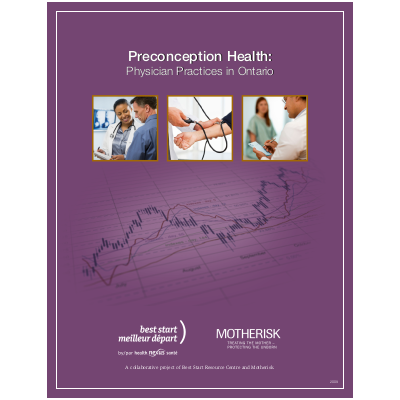 This report is the first of a series of 3 Preconception Health reports, and presents the results of a 2009 survey of Ontario family physicians regarding preconception health. The survey results provide the opportunity to learn about the preconception knowledge, needs and practices of family physicians. The report shares survey highlights, detailed survey results, discusses the context of the information and makes recommendations. This report will help service providers to consider strategies to strengthen preconception care in Ontario.